Marmaris National Park is set over 29.206 hectares, is just 6 km from Marmaris town and is a haven of flora and fauna; it has specially protected areas and plays a significant role in yacht tourism because of its indented coastline. The state highways 550 and 400 reach the National Park. Around the borders of Marmaris National Park there are beautiful quiet and unspoilt beaches, it is also close to popular Paradise Island (Cennet Adası), the Carian ancient cities of Physkos and Amos, it has areas for picnics and camping and “Horse Safari” tours are also available. 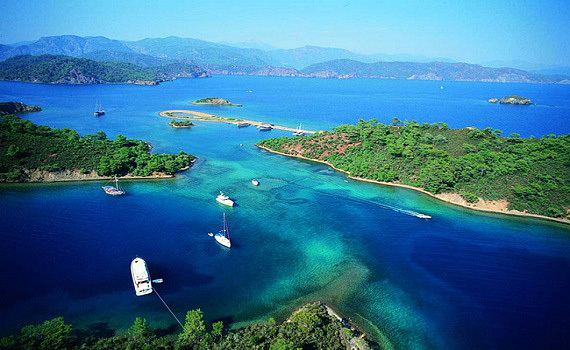 About half hour journey from the Marmaris, situated spectacular beaches, with interested scenery along with the sea. It is worthwhile, for example, to travel to the Cleopatra island, where it is said, that it has the the best sand in world. The national park of Marmaris is mainly comprised of red pine (pinus brutia). The sweetgum trees being an endemic type are gathered in certain regions of the area. Red pine, oak, plane tree, cypresses form a beautiful landscape together in the valley. There are also, tree formed plants like wild olive, arbutus, sumac, locust, oleander and laurel spread over a wide area in Marmaris National Park. The national park of Marmaris has rich wildlife. Besides the wild goats which live especially between Marmaris-Koycegiz, there are also mammals like bears, foxes, pigs, red squirrels, weasels, hedgehogs, lynx, martens, jackals etc. The variety of birds living in the region attracts your attention. Besides the eagle and falcon, wide areas also host immigrant birds increasing the variety. Marmaris National Park is also the site of the ancient cities of Physkos (Marmaris) and Amos (Hisaronu), which used to be called the Caria region and still has evidence of the colony of Rhodes. In Amos, there are the remains of a theatre, a temple and sculpture pedestals, which are surrounded by city walls. The Physkos walls date back to the Hellenistic age. It developed as a harbor city of Caria. Not much has reached our day from the ancient city. In his work the 19th century researcher Charles Texier mentioned the remains of a fort in the Fineks Mountains, overlooking the Phsykos Bay. It is known that Alexander the Great who conquered Marmaris in 334 BC had the fort repaired because of its strategic importance. Ottoman Sultan Kanuni Sultan Süleyman (Suleyman the Magnificent) conquered the region in 1522. From here he starteda campaign to Rhodes and took it over the same year. Marmaris was called Mimaras during the Ottoman period, later called Mermeris and finally became Marmaris. Gokova (Gökova) Environmental Special Protection Region: This region plays an important role in yacht tourism with its indented coast. Red pine and sweetgum (liquidambar orientalis) forests hold good value in the region, where it is possible to see all the Mediterranean plants together. High quality forests concentrate in the Kıran Mountain slopes on the north coast of the Gokova (Gökova) Inlet. Gokova (Gökova) and surrounding mountains accommodate rich flora. This region is rich also from the point of animals. There are many wild animals living there especially in the southern part of the bay. Bozburun Peninsula Environmental Special Protection Region: The region remained untouched due to difficulties in transportation. Regions outside the settlements are defined as cultural and natural protected areas. Datca (Datça) and Bozburun settlements have been developed as large settlement centers. Datca (Datça) and surrounding urban protected areas are planned to comply with the architectural styles in the region. All waters, marshes, reed beds no deeper than 6 m are defined as wetlands according to the International Ramsar Contract. Wetlands in the region are: The Gokova (Gökova) region coast and stream systems in Akyaka district, Akcapınar (Akçapınar) and Gokce (Gökçe) Villages, Akbuk (Akbük) stream systems in Akbuk Bay and Hisaronu (Hisarönü) stream systems in Hisaronu Bay. The list of plant species in a region is called Flora. If the variation of the plants is very special and limited to only one area, such plants are called endemic. The national park in Marmaris and Gokova (Gökova), Datca-Bozburun Environmental Special Protected areas all have endemic richness. Onopordum caricum: A type of thorn named after the old name of the region. Globularia dumulosa, cyclamen trochopteranthum, campanula fruticulosa, liquidambar orientalis. Also, garden sage, thorny daisy, cow tail and a type of date (phoenix theoqhrasti) which was supposed to be present only in Crete can also be listed as endemic. The protected areas of Gokova (Gökova) are rich in wild life such as bear, fox, wild pig, red squirrel, weasel, hedgehog, lynx, marten, wild goat and jackal, with a large variety of birds including eagles and falcons; it also plays host to many migrating birds. On the Kiran Mountain slopes north of Gokova (Gökova) Inlet there are concentrations of high quality forest and the protected area of the Bozburun Peninsula has remained mostly untouched due to the roads and transportation difficulties. The park also has regions of wetland, marshes and reed beds which are popular with different species of migrating birds. Aktas (Aktaş): Is a small settlement on the 3rd km of the road from the beach to the Fake Strait (Yalancı Boğazı). In the north its surrounded by forest hills, a peaceful point away from all the noise. It has fine sand on the beach. It takes its name from a high white rock near the sea. There are a few motels there. Adaagzi (Adaağzı): The road from Aktaﬂ passes through Adaagzi (Adaağzı) 2km further. This place is about to become a new settlement. It is a suitable point of the Marmaris cove for sea sports. Fake Strait (Yalancı Boğazı): A 800 m long natural formation which resembles a strait when viewed from Marmaris is called the Fake Strait (Yalancı Boğazı) (8 km to center) by the locals connects the Nimara Peninsula to the mainland. This set of bays is being used as a yacht port and slipway operations today. Paradise Island (Cennet Adası) and Nimara Cave: Paradise Island (Cennet Adası), which is known as an island but is, in fact, a peninsula, stretches out across Marmaris. The peninsula is one of the haunts of day boats. You can, as you like, go to the Fake Strait (Yalancı Boğazı), which is 8 km from the island, by bus or in your car and then climb Paradise Island (Cennet Adası), on foot. The forest road, which starts when you pass Yalancı Strait and step upon Paradise Island (Cennet Adası); is divided into two, namely, right and left. You reach Nimara Cave when you move forth 1km along the road heading left. Archeological data obtained from Nimara Cave brought into daylight in line with the information provided by the local people on the peninsula revealed the fact that the history of Marmaris dates back to 12 thousand years from today. The cave’s roadway is quite wide and full of numberless pendants and stalagmites that are about 3 m in height. One of the characteristics of the Nimara Cave situated on Cennet Island is that it hosts euplagias. Euplagias, after which the Kelebekler Valley in Fethiye was named, is a special type of butterfly taken under preservation due to the reduction in their living space. Physkos (Beldibi, Asartepe), Amos (Hisarönü, Turunç), Bybassos (Hisarönü), Kastabos (Hisarönü), Syrna (Bayır village), Larymna (Bozburun), Thyssanos (Söğüt), Phoenix (Taşlıca), Loryma (Bozukkale), Kasara (Serçe Harbor), Kedrai (Sedir Island), Euthena, and Amnistos (Karacasöğüt). All of these cities, including Physkos, are small Karian towns. The only remnants left from these cities, except for Physkos, are pieces of castle and city walls. Loryma (Bozukkale): It was established in the Bozuk Cove on the southwest end of Bozburun Peninsula. The most striking structure among the many remnants covering a large area over the cove is the well preserved castle on Burunbaşı, which originally had nine rectangular towers. Today, only the additional tower to the north is left. Bozukkale harbor is an important station for Blue Voyage boats and yachts. Kedrai: The Sedir Island (Sedir Adası) in Gokova (Gökova) Bay is known for the ancient Kedrai city and the famous Cleopatra Beach. Kedrai was a Karian settlement, it later came under Rhodian control. Kedrai means “cedars” (the tree). One of the most important settlements in the Rhodian Peraea, Kedrai was enclosed with walls. The castle and the walls can be seen from the shore line. Only the foundations of The Apollon castle, built in the Doric style in the city center, are left today. In addition to the Agora, several building remnants and city necropolis, there is a theater on the eastern part of the island, facing north, in very good condition. Hydas (Selimiye): Hydas is built in the Selimiye Cove (Kamışlı Cove) on the northern part of the Bozburun Peninsula. There are remnants of a castle and a mausoleum in the city. There is a surveillance tower on the shore, 3 km from Hydas, and a couple of graves on the tower. Erine (Hisarönü): On the 20th km of the Marmaris-Datça highway, the turn south to Bozburun is taken, and Hisarönü Village is 2 km from this turn. The ancient city is 3 km away from the village. There are Roman Era remnants in Erine. Castabus (Pazarlık): This ancient site and the holy temple near Hisarlık Village can be reached after a one-hour climb from Hisarönü Plain. The temple is situated upon a platform. The building has the characteristic of a 4th century B.C. Ionian architecture, it also has Doric elements. The temple foundation on the platform is visible. Magnificent walls supporting the platform are kept intact to this day. The ruined theater to the south is the only other structure identified in the area. Thyssanos (Söğüt): Remnants of the Thyssanos settlement are located 1 km to the southwest of Söğüt Village. The only remnants in this ancient site that has not undergone any excavation are pieces of walls, foundation blueprints, and wall parts. Phoenix, Fenix, Feniks, Fenike: Remnants of the Karian city Phoenix are located 4 km outside Taşlıca village. Between the village and the ancient site, there are graves on the side of the possibly ancient pathway. Around midway between Taşlıca and Asar Tepesi is found the agora of the city placed in a hollow, a quite well-preserved remnant of a building on the way up, and then the main necropolis (graves) of the city. The acropolis is on Asartepe. Bybassos: Present day Orhaniye village was founded on the slope of the hill where the remnants are located. The remnants of the city wall are visible scattered around the forest. Euthenna (Altınsivrisi/Karacasöğüt) was a Rhodian town. Remnants left are the city necropolis on the Altınsivri hill around 2 km to the southwest of the Karacasöğüt village, various parts of the city wall higher up, stone graves and the cistern. Amnistos (Karacasöğüt): There is another ancient city near Karacasöğüt. The remnants of the ancient city of Amnistos are on a cape close to the village. The remnants are parts of the city wall and the wall of the old harbor on the shoreline. Intersection point of the Aegean Sea and the Mediterranean Sea: Marmaris Part of the Mediterranean Sea between Turkey and Greece is the Aegean Sea. This is what the two neighbours call the part of the Mediterranean Sea between them. The Aegean Sea is connected to the Black sea by the Çanakkale and İstanbul straits. Turkey’s long peninsula coast lines both the Aegean and the Mediterranean Sea. The answer to the question “where do the Mediterranean Sea and the Aegean Sea meet” is Marmaris. Marmaris splits the Mediterranean Sea and the Aegean Sea with a long and narrow peninsula. The Marmaris Peninsula has always been an important part of the history of the Mediterranean Civilization with its strategic geographic position and its natural beauty and rich past. The Aegean played an important role in the development of the waterline civilization between the Mediterranean Islands and the shores of European Continent and East Mediterranean. The Longbeach Area is part of the long Promenade along the beach front from Icmeler till Marmaris Marina. Many Many hotels, restaurants, bars, cafes along this long beautiful walkway. Some sections of the Long Beach has a lot of activities and some parts are quiet and relaxing in the Pine forests. Shopping, Marina and Bar-street are all located in the downtown and old Marmaris section.. This is where nightlife is. After passing the Gunnucek Forest in Marmaris National Park, there are Resort Hotels here. Armutalan, second most popular area to stay around Marmaris. A lot of beautiful hotels, bars and restaurants spread out Armutalan area. Quieter compared to Marmaris Beach Front. Beldibi, It is generally the area of villa. Icmeler (İçmeler) and Turunc (Turunç) are small beautiful villages and they are resorts in themselves. Turunc is further away from Turunc, about 45 minutes drive from Marmaris. Icmeler is just 6 km. 10 minutes drive from Marmaris. Everything you will need to have a good vacation are available. Nice beaches, restaurants, bars, amazing hotels, promenades, water sports and more.